For so many days I had pages open on my ipad researching vegetarian cuisines from Brazil, France, Germany, Costa Rica, Argentina, Netherlands, Belgium, Chile, etc. The search was narrowed down to Brazil, Germany, Netherlands and Argentina.Unfortunately Brazil suffered a humiliating defeat in both the hands of the German and Dutch team. So today the finals will be played between Germany and Argentina. I must admit I didn’t watch the matches from the beginning, I usually wait for the quarter finals to get a bit excited. It has not been easy staying up till late watching football. What got me through, was the anticipation of that one or more goal. The most exciting game has to be the one played between Germany and Brazil. It was actually raining goals but what was sad to watch were the tears and disappointment on the Brazilian fans. I had decided that I would blog recipes from the two countries that reach the finals. Am I an ardent fan of football? Not really but love watching the world cup matches. I prefer watching cricket and football any day compared to tennis, golf or formula racing. For the past month the main topic being discussed is football. Before the world cup began if anyone asked me to name a few footballers, I would had said Pele, Beckham, Wayne Rooney, Ronaldo. But now I have heard of Suarez (the biter), Neymar, Messi, Drogba, Sneijder and so many more. The whole team can be kicking the ball around for 90 minutes but I still feel the toughest job is that of a goalkeeper, who has to defend a length of 7.32 metres. He has to be alert throughout the game as the ball can appear from anywhere. For tonight’s game, both the German goalkeeper Manuel Neuer and the Argentinian goalkeeper Sergio Romero have tough job on their hands. Coming to the cuisine of Germany, what comes to mind is wurst and beer. However schnitzel, Eintopf, Kasespatzie, Apfelstrudel (apple strudel) kartooffelpuffer, Schwarzwalder Kirschtorte (black forest cake) are some of the famous dishes of Germany. Then you have the humble potato salad made with bacon. However, I decided to make Lebkuchen. Lebkuchen is a honey, spices, candied peel and nuts cookies baked during Christmas. It is similar to the gingerbread cookie or biscuit but is softer. The cookies seem to be a mixture of a cake and cookie. We loved the rich spicy and honey taste of the cookies. As for Argentina, its a steak country. Some of the famous dishes of Argentina are Empanadas, Asado, Milanesa, Locra, alfajores etc. Argentina is also famous for its Chimichurri. Chimichurri is a green sauce used in grilled meat. The sauce is easy to make using flat parsley and/or coriander.Its different from a pesto. We normally use parmesan cheese and nuts to make a pesto. The sauce is nowadays widely used to serve with not only meat but with sandwiches and pasta too. Preheat the oven to 180°C. Grease baking trays with butter or line with parchment paper. Sift (sieve) flour, almond powder, cinnamon, nutmeg, ginger powders, baking soda, baking powder and cocoa powder into a big bowl. Add the mixed peels or crystallized ginger and mix into the flour. Put honey and butter into a small pan. Heat it over low heat and stir constantly till the butter melts. Pour the honey mixture into the flour mixture. Mix the flour with a spoon or spatula. Knead the flour into a dough. Initially it maybe a bit sticky. Leave it for 2-3 minutes. Take about a tablespoonful of the dough and roll it into a ball. Place it on the tray. Flatten it a bit (it should be about an inch thick). Repeat step 8 with the remaining dough. Remember to leave a space about an inch between the cookies. Bake the cookies for 10 to 12 minutes or till the edges are brown. Remove the cookies from the tray and place on a wire rack to cool. Place the chocolate pieces in a heat proof bowl or a small steel bowl or pan. Heat water in a pan. Place the bowl with chocolate pieces over the boiling water (bottom should not touch the water). Mix till the chocolate melts. Dip the cookie into the chocolate or top it with chocolate. If the dough is too sticky place it in the fridge for 5 to 10 minutes before you begin rolling the balls. 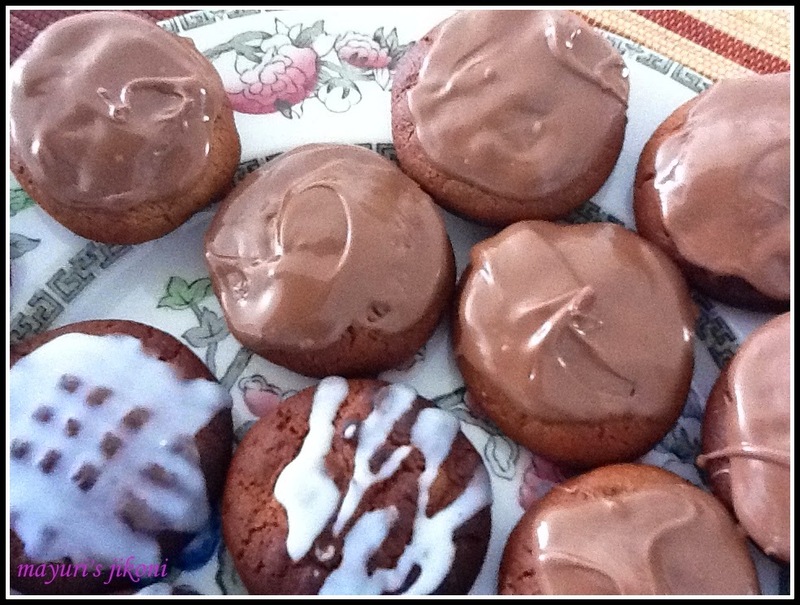 Top the cookies with glace icing. adding candied peels or crystallized ginger is optional. Put the garlic and onion in a food processor and grind to a paste. Process the coriander till it is finely chopped but not a paste. Add to the onion garlic paste. Store in the fridge till required. Use the sauce to serve with grilled meats, fish, paneer or vegetables. Add about a ¼ cup fresh oregano if you want to. Add red wine vinegar if you want a more tangy sauce. Next time I will be adding a bit of green chilli to the sauce. Tastes absolutely yummy with pasta. We both had football fever, yours looks really delicious. The cookies & the chimichurri sauce both looks yumm..
Lebkuchen and chimichurri sauce looks wonderful. Both Lebkuchen and chimichurri sauce love it.